ESS is a malignant mesenchymal tumor arising from the uterus. It rarely may occur in the extrauterine location where it is called endometrioid stromal sarcoma [also known as extrauterine endometrial stromal sarcoma (EESS)]. 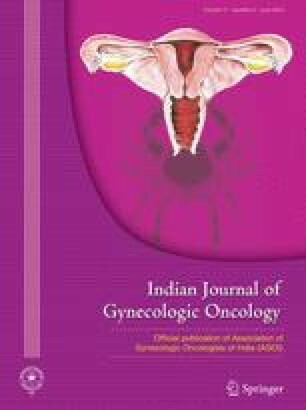 A patient Ms. X 20-year-old unmarried female presented to the outpatient department of Deen Dayal Upadhyay Hospital in July 2018 with the complaint of pain in lower abdomen for 1 week. MRI pelvis showed a large complex space occupying lesion with mixed cystic and soft tissue component measuring 7.2 by 8.3 by 6.8 cm showing non-homogeneous contrast enhancement. Per-operatively a highly vascular 10 by 20 cm cystic mass with necrotic and hemorrhagic areas was present which was densely adherent to omentum and mesentery. Uterus with bilateral tubes and ovaries was normal, and mass was arising from left round ligament. The final pathological diagnosis was given as stromal sarcoma of the round ligament with associated endometriosis. Headline: Extrauterine endometrial stromal sarcoma (EESS) is an uncommon tumour that occurs in women over a wide age range and has vague presentations.